The idea of buyer personas seems to be sweeping the world of B2B marketing – another example of a business-to-consumer concept being embraced by the business-to-business world. Anticipating how different types of stakeholders are likely to think and behave is clearly helping to improve the quality of marketing messages and initial sales conversations. But in complex B2B sales, we’re not just selling to individuals, but to teams of people within organisations, and I wonder if we haven’t been missing an important implication that is unique to B2B: those organizations have personas too! Every company has a personality, and it’s not just restricted to what is conventionally thought of as “company culture.” From a B2B sales and marketing perspective, we also need to understand how they are structured, how they behave, and how they are reacting to the trends and events are currently affecting them. 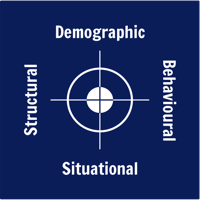 It’s increasingly widely recognized that the traditional dimensions of demographic segmentation – size, sector, and geography – are an inadequate and incomplete basis for identifying the organizations that have the potential to be your most valuable prospects and customers. Structural factors can be either internal or external, and are for the most part issues of fact rather than judgement. These factors are concerned with issues like how the potential prospect is organized internally, what internal systems they have in place, and how they are positioned within their market. Ultimate ownership – Are they independent or a subsidiary of a bigger group? Position in market – Are they the market leader, the leading challenger, a key player or an also-ran? How is the organization managed – Is it highly centralized, or widely decentralized? What competitive systems have already been installed? What complementary systems have already been installed? What is their primary growth strategy – Organic or acquisitive? Are they committed to key management strategies such as Lean 6 Sigma? These structural factors tend to change relatively slowly over time, and are therefore good indicators of which types of organizations within your target markets are likely to represent your best long-term prospects. Even if there is no opportunity today, they are the sorts of factors that indicate that there is likely to be potential for the future. Behavioral factors can also be either internal or external, but are more often issues of judgement, observation, or informed supposition rather than hard fact. These factors are concerned with how the organization behaves when it comes to things like their decision making style, their relationship with vendors, their appetite for innovation and their role in their markets. Decision making process – Where does the real power lie – with operations, finance, or IT? Are they more driven by creating value or by cutting cost? How do they measure and reward the performance of their managers and staff? Vendor relationships – Are they collaborative or confrontational? Appetite for technology innovation – Are they an early adopter, fast follower, pragmatist, or laggard? Influence in their market – Are they seen as a trendsetter or a follower? These behavioral factors are often more subtle – and harder to evaluate – than the organization’s demographic or structural characteristics, but as any top performing sales person will tell you, the cultural alignment between prospect and vendor can make a significant difference to your chances of doing business with the organization. A recent change in senior management. A recent or upcoming change in corporate ownership (acquiring or being acquired). A significant new investment round. Significant new corporate initiatives, high-profile product launches, or change programs. Externally imposed legislation or regulation. Expansion into new product areas, geographies, etc. Significant sales recruitment or channel expansion programs. Significant recent changes in their market, competitive landscape, or go-to-market-strategy. Demographic, structural, and behavioral insights can tell you whether an organization is a worthwhile long-term sales prospect: situational factors can tell you whether that organization is likely to have an active or latent need that you are in a position to satisfy today. You can learn a lot from bringing together the people who best understand these customers and prospects, explaining the difference between demographic, structural, behavioral, and situational factors and getting them to brainstorm the common characteristics. Sales clearly has a key contribution to make here, but don’t forget your senior executives or your pre-sales, consulting or customer support teams – these groups are also capable of coming up with some fascinating insights. Capture everything you hear, but be sure to identify and highlight the most important factors in each category. Mastering organizational personas opens the door to a number of important benefits: First, you can target your demand generation and prospecting activities towards the “sweet spot” organizations that are most likely to want to do business with you. Second, they can help you more accurately qualify potential sales opportunities. Third, once an opportunity has been qualified, awareness of an organization’s persona can help you adjust your sales tactics to fit. If you’d like to learn more about understanding organisational personas, I recommend that you read our latest Blueprint for Breakthrough on “Identifying your key target organizations.” You can download your copy here. Please let me know what you think of the concept. This article was syndicated from Business 2 Community: Organizations Have Personas Too!